And I’m an addict. A video game addict. Plenty of my friends, including my beloved Mark, are game programmers, so I am somewhat reluctant to say this next thing I have to say. But I feel I must tell you, interwebs: video games are a blight on the human condition. See, here’s how I see it: we, as human beings, are driven to accomplish things. To make, to create, to do. It’s a need–one at the very top of Maslow’s Pyramid, but a need just the same. It’s why we write books and compose songs and put people on the freaking moon. Games fill that need. Or rather, they provide the illusion of filling it. In the same way that a Krispy Kreme doughnut is fake food, games are fake accomplishments. And just as a doughnut is sweeter than any legitimately nourishing food, in-game accomplishments come faster and more reliably than any legitimately nourishing acts. They fill you up, too. 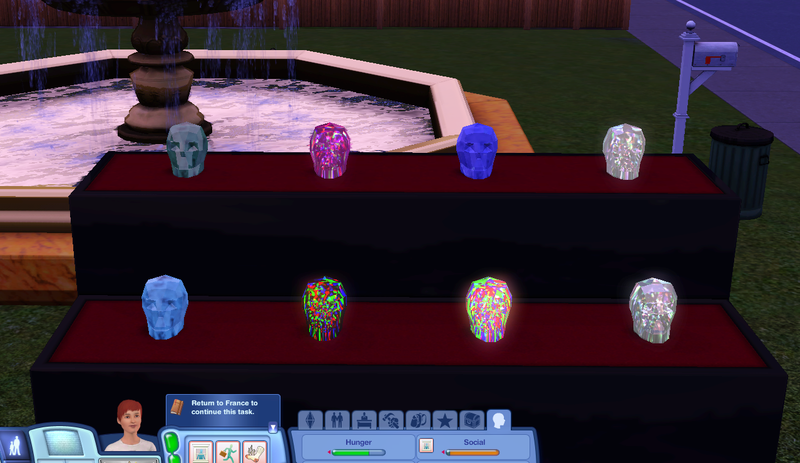 Who really needs to write a book when you’ve just completed your collection of skull cut gems in the Sims? Would you like to know how many hours of my time this picture represents? Yeah, so would I. All of this is my way of saying that if I have one true enemy in my quest to become a published writer, it is EA Studios. No, wait, it’s Wizards of the Coast. No, wait, it’s me. This was written by jane. Posted on Monday, July 26, 2010, at 4:42 pm. Filed under Procrastination. Bookmark the permalink. Follow comments here with the RSS feed. Post a comment or leave a trackback. A Krispy-Kreme doughnut isn’t food? Jane, you’re killing me!